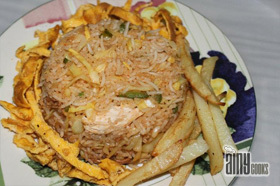 Singaporean Rice is a very famous and popular rice dish in Pakistan.Thou i am not sure these are basically from Singapore or not but in Wedding menus this aromatic rice platter topped with creamy sauce and fried noodles is a hot favorite of all. 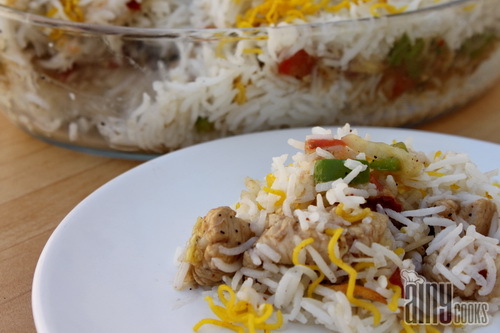 This recipe is again of my favorite Chef, Zakir and make my words this is the best recipe around. Corn flour 2 tbsp dissolve in water. Oil for frying noodles and for cooking. Boil water and add Turmeric or pinch of yellow food color in water. Add noodles and boil till soft. Drain noodles add in hot oil fry them. Place them on paper towel after frying. In a deep pan add water ,add salt, cumin seeds and 2 tbsp oil, boil it and add rice.Boil till done. Cut green chillies and garlic cloves longitudinal and fry both in oil, set a side. Cut carrot, capsicum and cabbage in cubes. In a pan add oil and add ginger garlic paste and stir for few seconds then add chicken cut in cubes, again fry it till color change. Add all vegetables and fry on high flame and start adding salt,white pepper, black pepper, oyster sauce, Worcestershire sauce , ketchup, and chili garlic sauce. Stir it and add 1/2 cup chicken stock , add corn flour dissolved in water. It will become thick , remove from stove and set aside. In a small bowl mix mayonnaise, red chili flakes and water to make a creamy sauce. 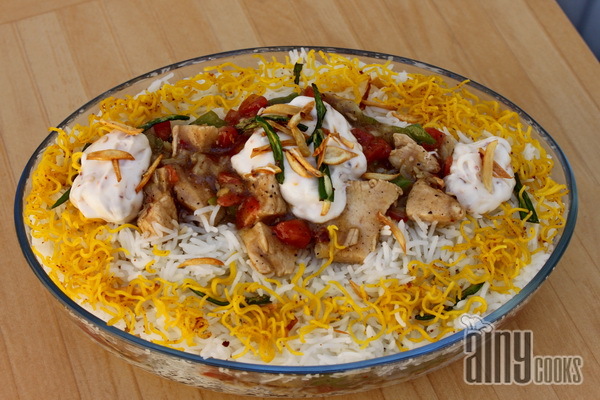 Now in a dish give layer of boiled rice then spread chicken and vegetable gravy on rice.Again give layer of rice and then spread mayo sauce and fried green chillies and garlic. A lot of cooking steps involved in this dish. Take my advice and start from frying green chillies and garlic. Then boil noodles and fry ,set aside. During frying start boiling rice. Cut vegetables. and as soon as your rice done cook chicken gravy. Make a Mayo sauce and arrange all the things on counter in front of you. 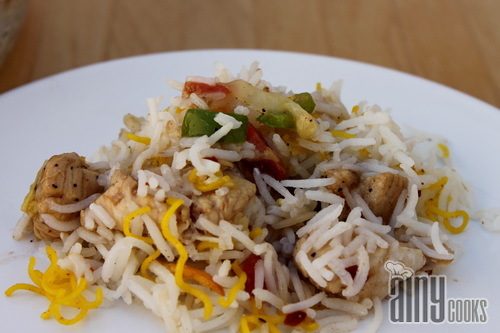 Singaporean rice does contain a high spice level for kids so be careful during mixing rice with gravy. Or you can cut down spices according to your taste. This looks so flavorful! Amazing dish! 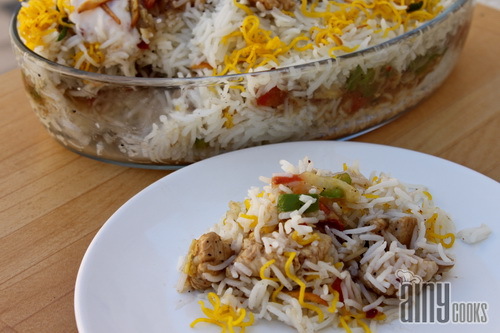 Assalamualaikum sister.I hv tried dis recipy today it was wonderful….thanks to Allah swt that I found ur web page to experiment my kitchen.lots of love and duwa for u and ur family.ramadan kareem. I have looking for the recipe withfried crispy noodles for so long. Today i accidentally found it and i am so glad about it. Thank you. Your photography is amazing and appetizing too. Good work. Thanks a lot Subica, I have used simple spaghetti or even boil knorr noodles in yellow color and fry.